I’m interested in costume history, so on my first morning as a volunteer, I was delighted to find a piece of tapa cloth in the ReThink Exploration space. It is believed to have come from Niue, an island in the Pacific near Tonga and Samoa. The cloth is papery to touch, fairly stiff and decorated with a wonderful surface pattern of motifs. I was curious to find out the significance of the motifs, how the cloth was made and why the lower portion had been left undecorated. Was it an unfinished project or a sample for a more elaborate one? I discovered that tapa cloth ceased to be made on Niue after the turn of the 20th Century but it was revived in the 1970s at a competition organised by University of the South Pacific. Perhaps the cloth was made by a local Niuean experimenting with a forgotten tradition? The design appears freeform in style, a technique typically Niuean. Also, the dye has been brushed on quite thickly, perhaps applied with the fibrous ends of the Pandanus seed? Polynesian artists are inspired by the organic forms around them such as the Trochus shells found along the islands’ seashores. These shells are depicted on the cloth as a string of black triangles following an arc. A predominating motif of the cloth is a tapering trunk sprouting feathery needles. This represents the Hala Paini or Norfolk pine. These trees are significant to the Polynesians as they line the road to The Royal Palace of Tonga. Polynesian artists also depict history or natural occurrences, such as Halley’s Comet. Insects, feathers, birds’ footprints and even structural elements make up the myriad of symbols incorporated within their designs. In Samoa, designs are produced by applying dye to the fabric over a carved wooden tablet or ‘upeti’, a similar process to brass rubbing. Another technique is stencilling. Traditionally, shapes were cut from banana leaves but today stencils are made from plastic as they are more durable. 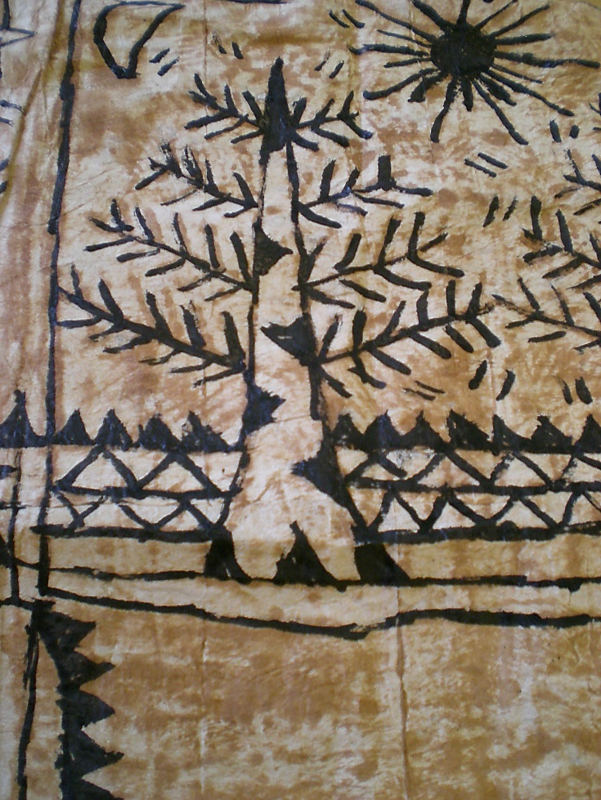 Bamboo stamps may have been used to produce this Niuean design shown below. The fluted edges of this Niuean cloth reminds me of dried banksia leaves, similar to the ones documented by the botanist, Joseph Banks who accompanied Cook on his first voyage. Tapa in the Pacific islands is made from the bark of the Mulberry tree and it’s a lengthy, manual process, mostly carried out by women. When the stalks are ready, they are picked and their outer bark removed with either a knife or the tapa maker’s teeth. The more malleable inner core is soaked for a few hours in water and then beaten down with a hardwood mallet, called a tapa beater. Once the strips are complete, they are glued together either with arrowroot or tapioca. The Niue cloth in the Re:Think space doesn’t look glued but fused together to produce a seamless finish. Apparently this is a superior technique usually associated with Hawaii tapa. All dyes for tapa printing are produced from organic matter indigenous to the island where the cloth is made. For example, Hale berries will produce a green or blue dye. In fact, tapa making was introduced to the island of Niue by missionaries in 1840. This poncho or tiputa came from Niue in 1800 but it is not known whether it was made there. Tapa was worn for a variety of functions, especially religious ceremonies. The King of Fiji wore a thick tapa waist roll to denote his wealth and position. Tiputas with a fringed edge were predominantly worn by chieftains at high ceremonies. Chiefly women were permitted to wear their tiputas every day, to maintain their skins’ untanned appearance. Even Captain Cook wore tapa! Or nearly…While he was away on his third voyage, his wife Elizabeth began stitching a tapa waistcoat for him with cloth he acquired from Tahiti. Unfortunately, the garment wasn’t completed because Cook never returned, having been killed by natives in Hawaii. It’s is a bit damaged by ink but the outline of the 18th Century pattern is just discernible.